I have to pinch myself that I’m actually visiting Niagara Falls, in Canada. If ever there was a time for spectacle screen wipers this would be it, I can barely see and spray assaults my eyes like mini missiles when I take the glasses off. But it’s exhilarating and we can’t stop laughing at the absurdity of it all. I can’t believe we’re visiting Niagara Falls, a natural wonder of the world. 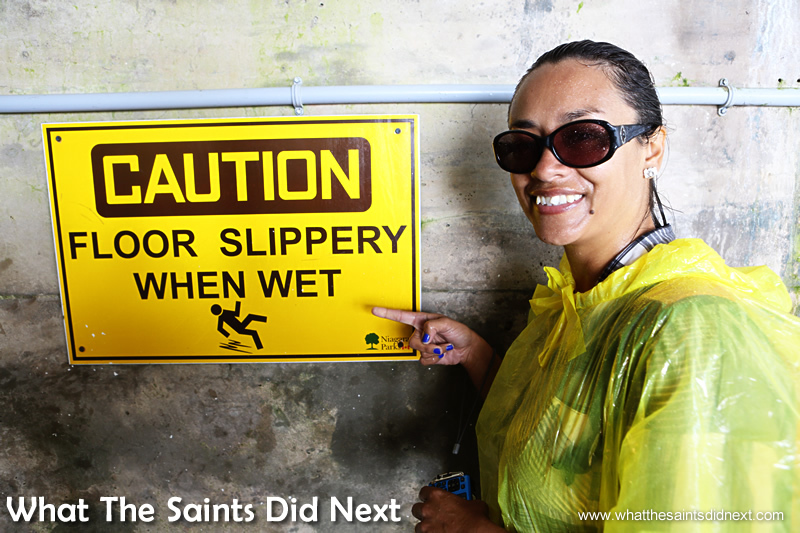 Two ‘Saints’ who’ve travelled thousands of miles from home, now stand here feeling like we’re being pummelled by the mighty waterfall. It’s one of those moments where I shake my head in amazement. The ‘up close and personal’ observation deck. Down the steps in the centre takes you out onto the open deck. The roar of the waterfall from being so close is almost scary! We entered the Park half an hour ago, made a beeline for the ticket booth and chose this ‘Journey Behind the Falls’ tour costing $16.75 (Canadian) each. 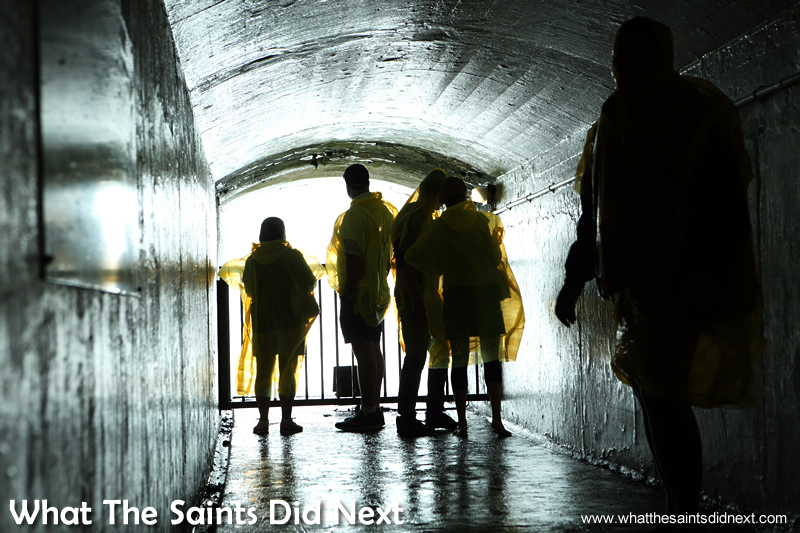 It gave immediate admittance (no waiting around), a yellow plastic poncho (telltale sign) and an elevator ride 38 metres down inside the rock face. Niagara Falls is collectively three waterfalls and is split between the Canada and USA border. The Canadians have Horseshoe Falls which in my opinion is the most impressive; the Americans have American Falls and Bridal Veil Falls. 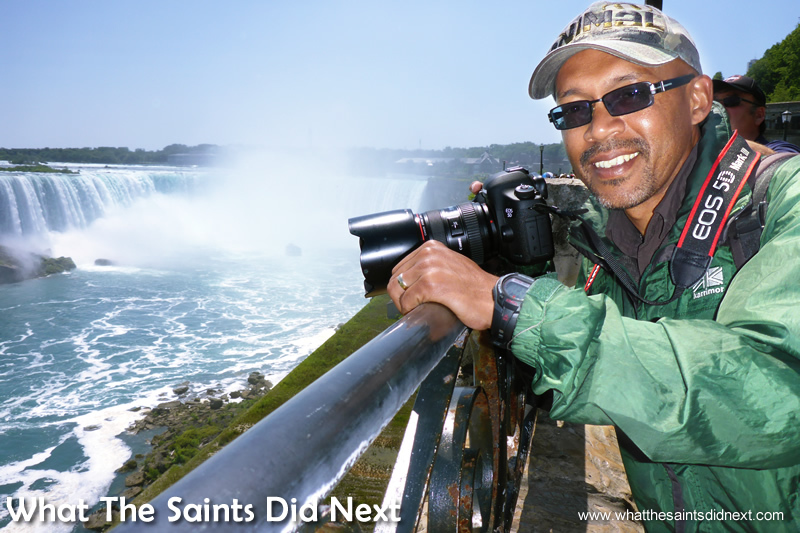 We’re visiting Niagara Falls, Ontario on the Canadian side at the Table Rock complex. Horseshoe Falls, precisely named for its curved shape, is 54 metres high (we thought it was taller) with a rim of 675 metres. 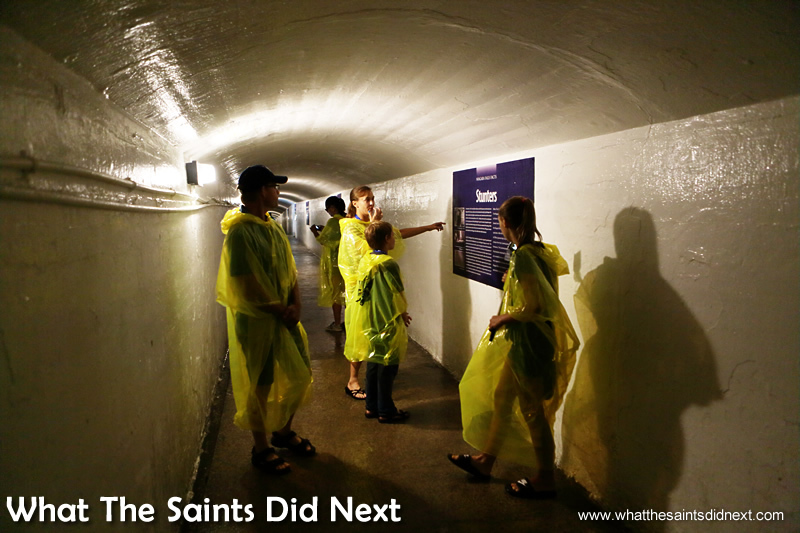 The tunnels we walked through after the elevator ride were dug in 1889. The roar of the powerful falls could be heard as soon as the elevator door pinged open. 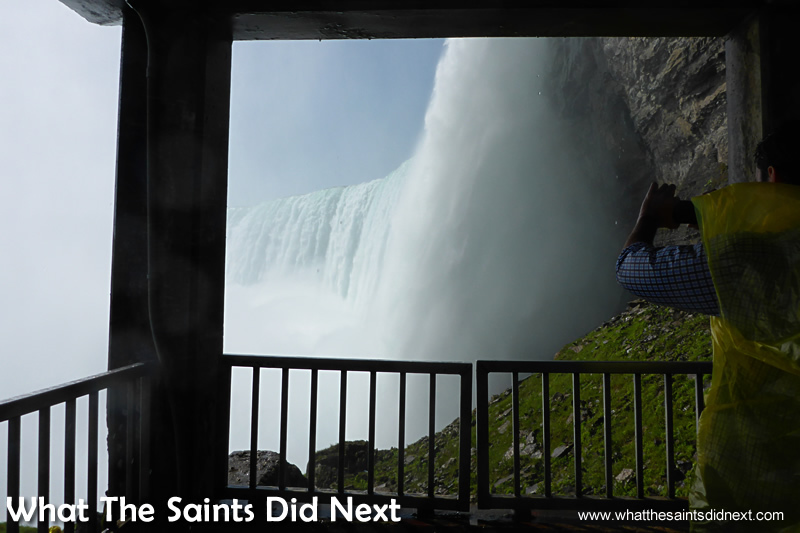 We headed toward the light and noise and spilled out onto this observation deck just metres away from the thick fluffy curtain of the side of the falls. A breathtaking sight in the true sense of the word and it feels strangely dangerous to be so close, heightening the thrill. Out on the open observation platform being assaulted by the stinging spray from the Falls. The warning sign could have given more of a hint of what was to come! My poncho is losing the battle against the constant wind and whipping mist, I can feel water running down the inside. Everything is wet; hair, shoes, glasses and shirt cuffs. It’s a good thing we have a waterproof camera, but even that’s proving difficult to keep the lens clear of water droplets. It’s near impossible to see, even breathe. We’ve been taking selfies blindly because the mixture of harsh sunlight and mist makes it hard to view the results on the small screen. The tunnel ‘behind the falls’ run 200 metres in length and at two viewing points tourists can watch what looks like a giant tap turned on full force just five metres directly behind the actual falls. 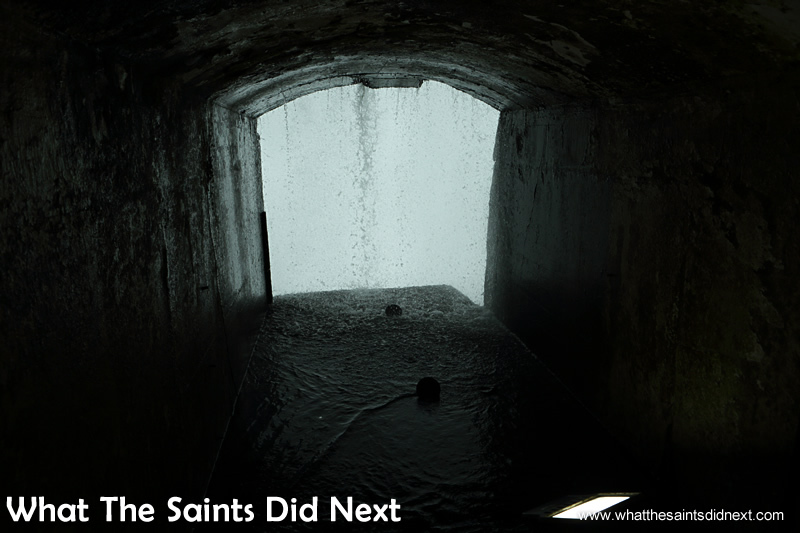 Inside the 200m tunnel that runs adjacent and behind the Falls. One of the two tunnel openings that allow you to stand directly behind the powerful Niagara Falls. The close up view – not quite as spectacular in a photo as being there!! Unfortunately the crowds have picked up, they too are visiting Niagara Falls and we have to queue for our turn to look out the dug outs. It doesn’t allow much time to take photos and fully appreciate the crazy location because we’re conscious of others behind. We underestimated the morning traffic and arrived here from Toronto later than intended, but it’s definitely worth aiming for an early start to beat the crowds. During summer months 154 million litres (34 million gallons) of water flow over the falls per minute. That’s enough to fill 1 million bathtubs. This natural energy is harnessed to power one of the largest hydro-electric power plants in the world. 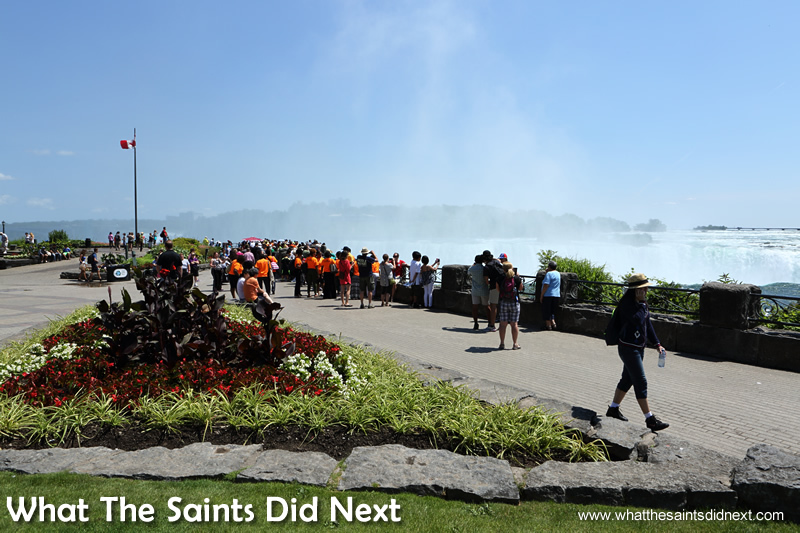 Niagara Falls annually welcomes 12 million visitors including some notable famous ones over the years; Marilyn Monroe, John F Kennedy (at separate times), Princess Diana and boys and Superman. The viewing platform above lets visitors get very close to the edge of the waterfall, only it’s then difficult to fit it all in the photograph. Can’t believe we are visiting Niagara Falls. 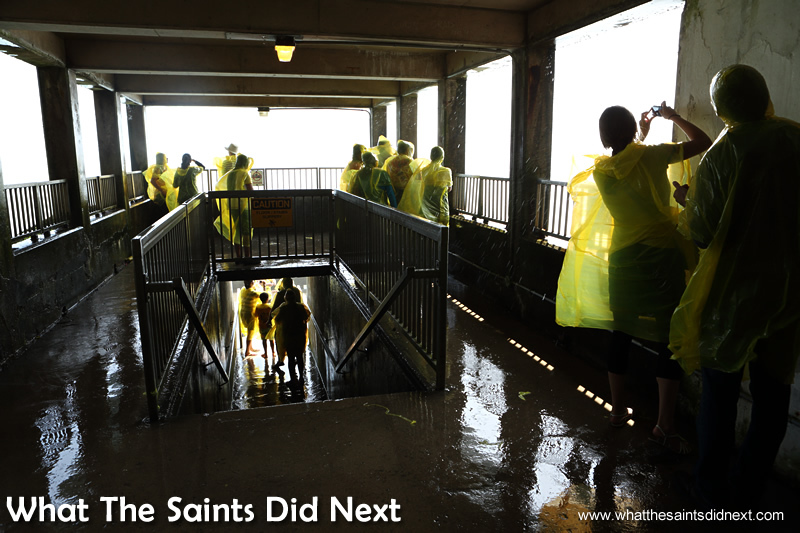 If there’s one thing we are ever so slightly disappointed about with the falls is the height. Back in the late 70’s the Man of Steel rescued a boy from certain death when he fell over the Horseshoe Falls. In ‘reality’ the boy would have died before Lois Lane could even utter ‘help.’ In the movie Clark Kent had time to change, ascertain were the accident was and swoop in to save the day. All the time the boy is free falling down a seemingly high fall. 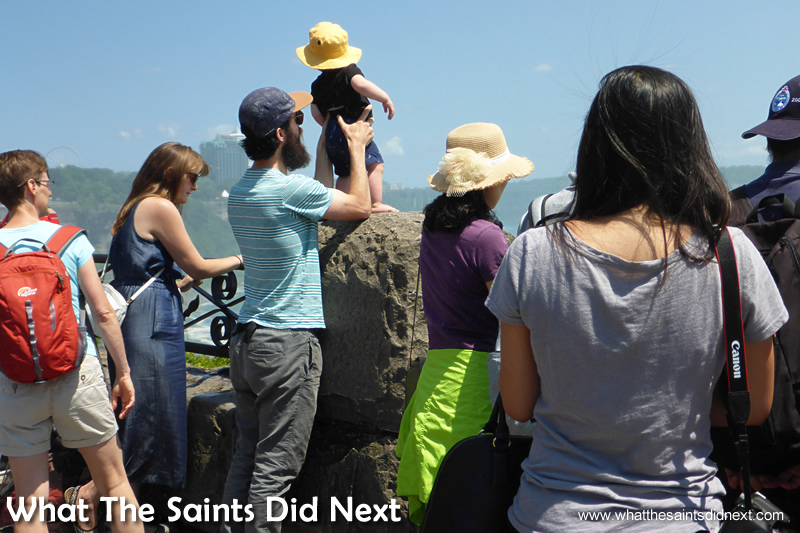 Superman lied, we discovered this first visiting Niagara Falls. 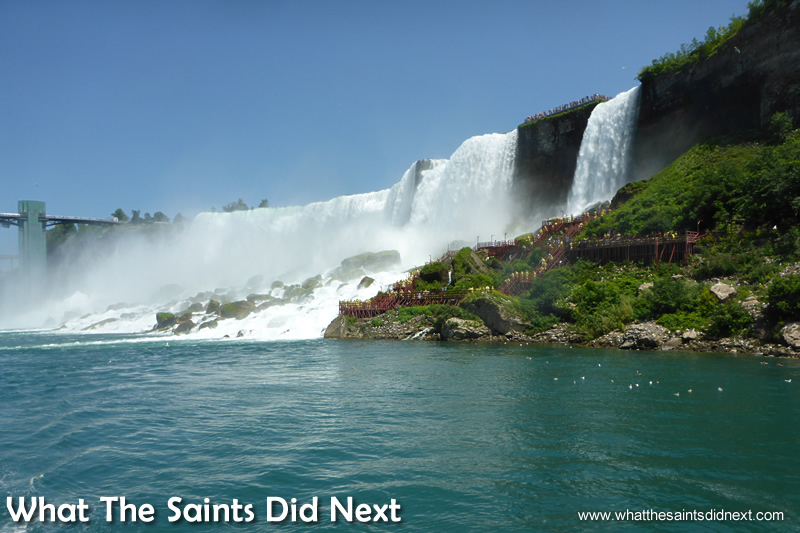 The movie falsely portrayed the falls to be much higher and instilled this lifelong belief upon us. Damn you Hollywood! This small child gets a much closer view than I would like. The constant cloud of spray generated by the waterfall hangs over Niagara Falls. 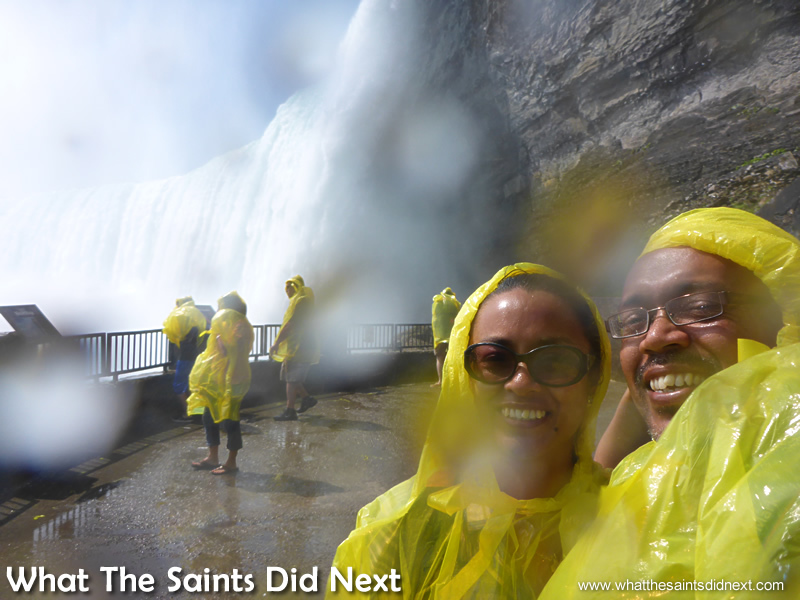 Darrin’s rain jacket is because of the spray from the waterfall – it was actually a hot, clear day, perfect for visiting Niagara Falls. 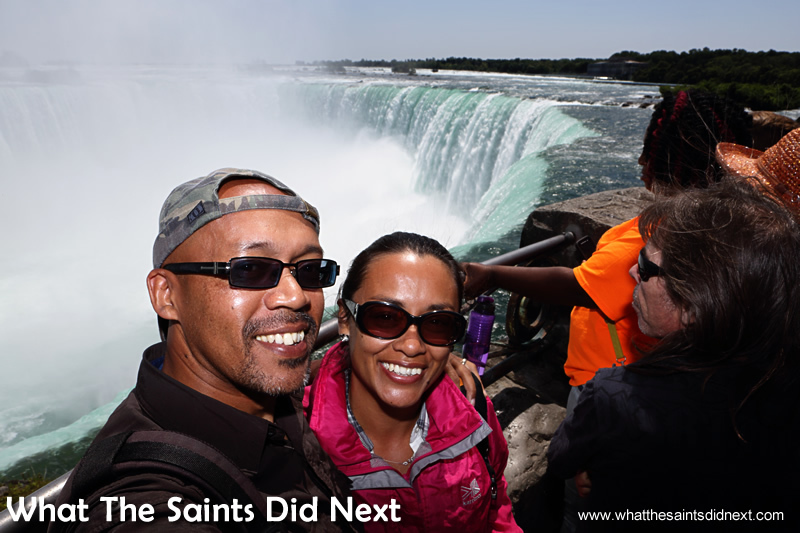 The Table Rock promenade is the perfect place to watch the falls, the view is so mesmerising I could stay here all day. There are telescopes and hot dog stands, gift shops and restaurants. In fact, there are plenty of things to do in Niagara Falls including helicopter rides and other tourist attractions. Sunshine illuminates the water a stunning turquoise green. The colour apparently comes from dissolved salts and ‘rock flour,’ very finely ground rock, picked up from the limestone bed. We watch enthralled as torrents of water plummet over the rim causing an ever present misty cloud that reaches high up into the sky. We wander along watching boat loads of people disappear momentarily in the mists, riding daringly close to the falls. Across the valley on the American side, blue poncho-ed bodies trek a wooden staircase down the sides of the American and Bridal Veil Falls. 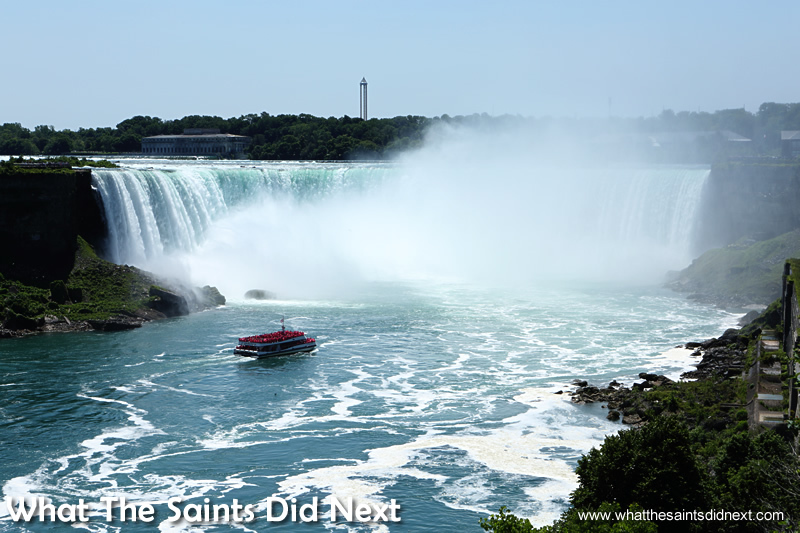 Two boat tours are available at the falls; the famous ‘Maid of the Mist’ operating since 1846 on the US side and the new (2014) ‘Hornblower’ on the Canadian. On the deck of the ‘Hornblower’ on our way to get wet. The American Falls and the smaller Bridal Veil Falls on the USA side. 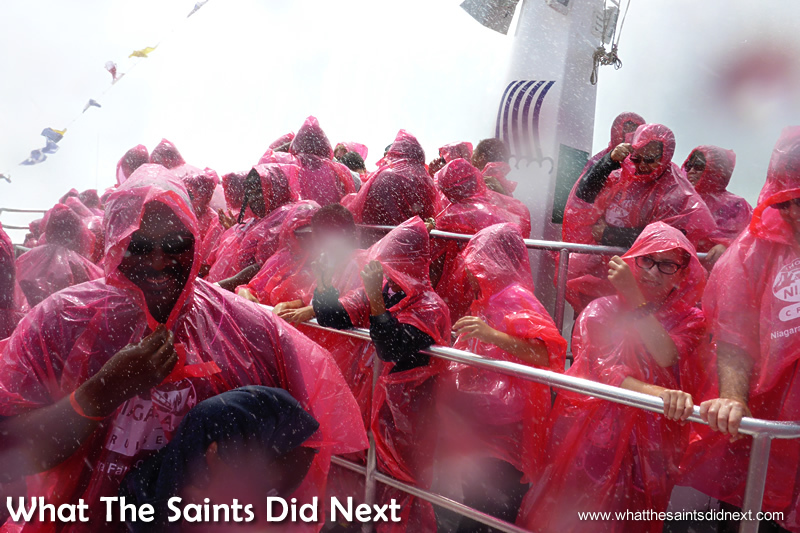 Finally we’re handed red waterproof ponchos, board the launch and dash to the upper deck with hundreds of other excited travellers. The ‘Hornblower’ boat is BIG; it has two decks and a 700 passenger capacity. We wave to some of blue ponchos on the US side as we cruise by American and Bridal Veil Falls chugging closer and closer to the 54m cascade of Horseshoe. I look up and watch someone jump the rails on the US border of Horseshoe, walk out on the ledge, take some quick photos and hop back. Adrenalin junkie. Seriously? The Things People Do! Niagara Falls daredevils are legendary, people gambling their lives for fame and fortune. The most notorious is Annie Edson Taylor, a 63 year old teacher who in 1903 became the first person (along with her cat) to go over the falls inside a barrel and survive. 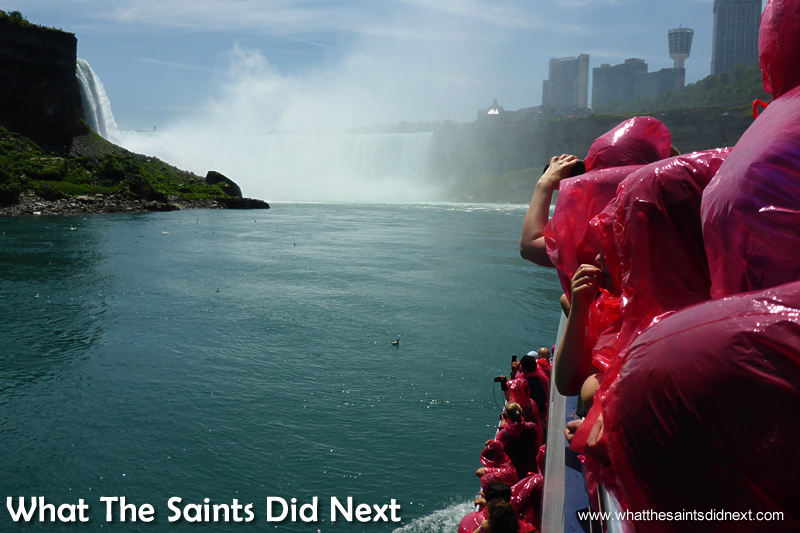 This is what it’s like being on the upper deck when ‘Hornblower’ reaches the Falls. Viewing Niagara Falls from the deck of the Hornblower boat feels like a 4D movie themed ride. The view of Hornblower from The Table Rock promenade. This boat cruise is as daring as I’m willing to get to the ferocious downpour. The thunderous sound is so loud we have to shout to be heard. The drenching begins as we enter the mist cloud. The many children onboard are squealing with delight and cameras go on overdrive. All too quickly we’re heading back to the docking station, soaked and gleefully happy. The voyage took about 20 minutes. It gets harder to impress or affect people in this day and age, thankfully Mother Nature is always on hand to remind us how awe-inspiring and dazzling she really is. In these situations you can’t help but stop and stare. There is free admission into Niagara Falls State Park; parking for the day is $20. The Falls suddenly become visible as you drive along main road toward the Visitor Centre; be careful not to get distracted, there’s a lot of foot traffic around. Much easier to take pictures as we sail away from the base Niagara Falls. 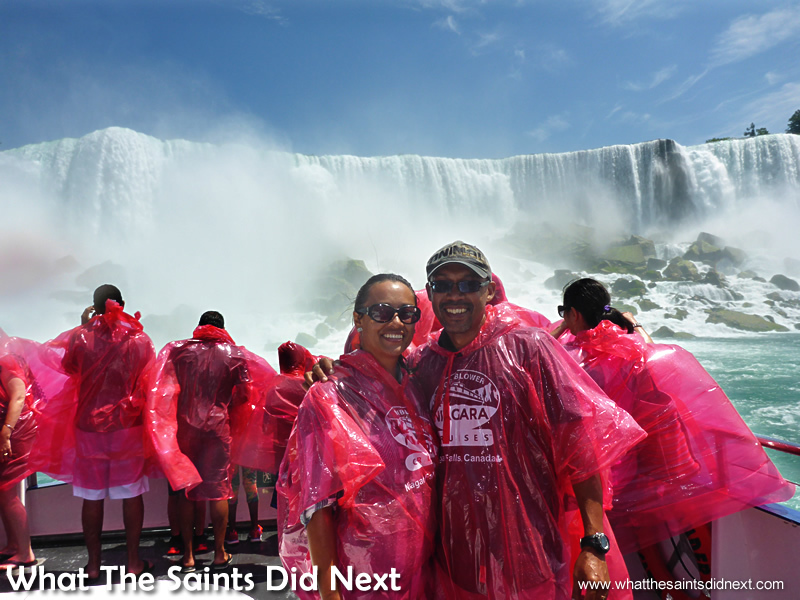 When visiting Niagara Falls a basic Adventure Pass ticket package costs $65.00 and includes Behind the Falls, Hornblower cruise with extras of the White Water Walk and the Niagara Fury simulated film. 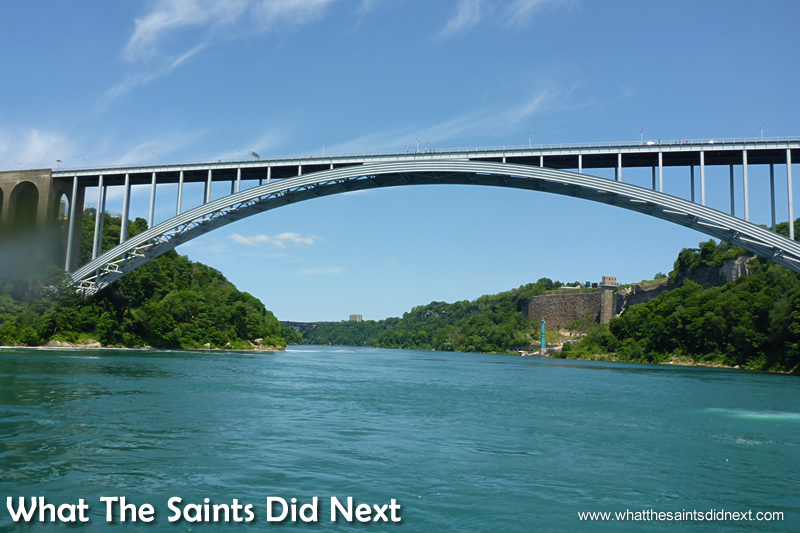 Within the Park vicinity, Rainbow Bridge crosses the Niagara River and connects to America. Those with passports can do a border crossing by foot or car to experience both sides of the Falls. The Rainbow Bridge with connects Canada and the USA and looks down on the spectacular Niagara Falls. Amazing stories and photo’s you both planned your trip extremely well I think your Blog is an educational tool, who knows!! with St Helena having air excess could change peoples way of thinking and planning their holidays. Ha ha! Henry’s Travels Agents St Helena. Thanks Borbs! As the saying goes, travelling is the best education. The airport will open many travel opportunities and hopefully all can enjoy them. 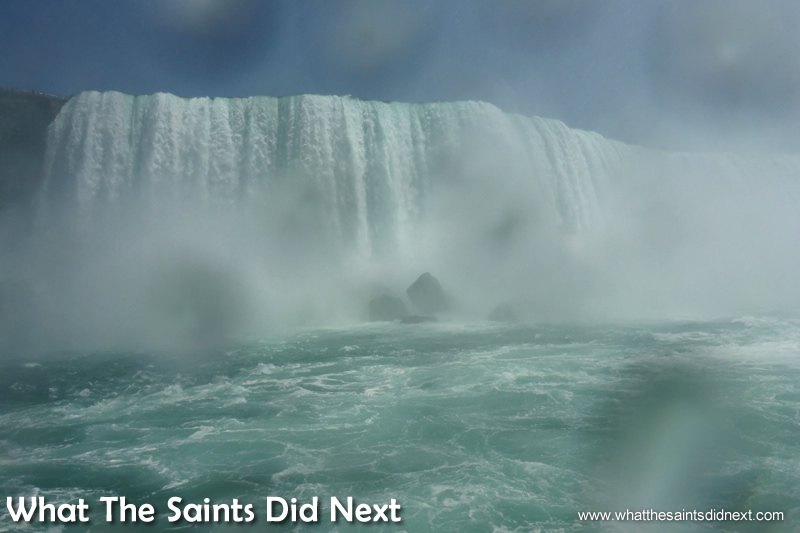 Spectacular photos of the Niagra Falls….. What a wetting you guys received so close to the falls. We had an absolute drenching Neville! So much fun and a lifetime experience. You probably won’t believe me, but in 1979 my cousin took me there after I sailed in the world one ton world sailing championships in Newport RI. They were filming Superman at the time and all the wires and stage sets were there and we were told where to go and where not to go. It was an awesome experience. Will be loading Keith Yon’s new boat onto the RMS before she sails, hope to see you there. This could be a good shoot? Wow what a claim to fame that’s an awesome story. Bet it felt good when you watched the Superman movie when it came out. Although you wouldn’t have been conned by the height of the Falls! Great pictures, as usual. Thanks too for the wonderful narrative that almost had me towelling-down after reading it! Ha ha! Thanks for the feedback. 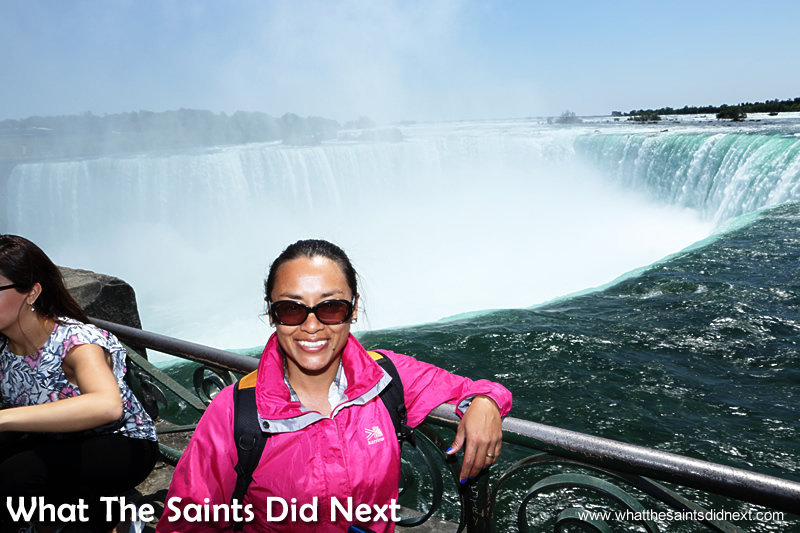 It’s such a tremendous experience to get totally drenched by the Falls.